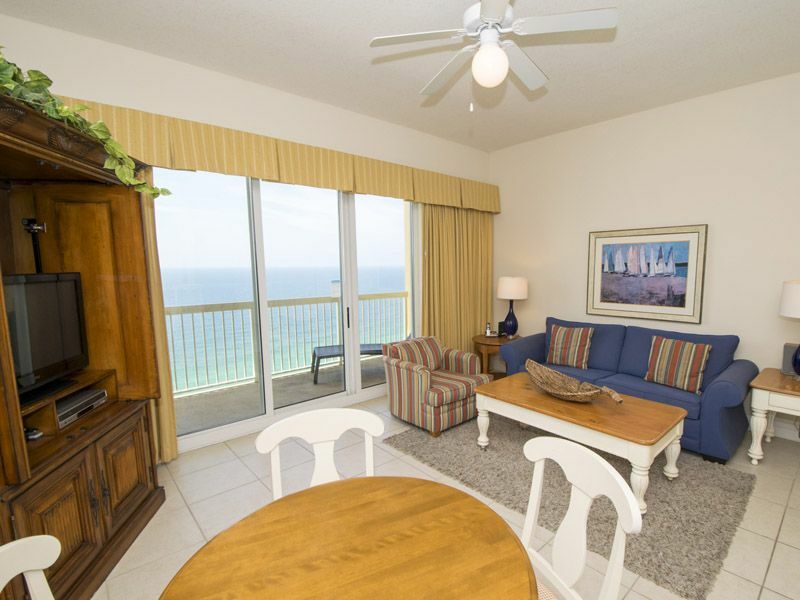 Calypso Resort ~ Beachfront PCB Condo with Private Balcony Overlooking the Gulf! Looking for a spectacular view from your vacation condo? Calypso Resort and Towers #2303E is the condo that you are looking for! Located high above the shoreline with breathtaking views, relax on your private balcony as you listen to the waves lazily roll onto the shore. Lounge by one of the two pools with a cool drink in your hand from the onsite Tiki bar. Enjoy the free WiFi that this unit has to offer or visit the fitness room onsite to keep your fitness goals in check! If you would like to venture out during your stay, walk across the street to Pier Park for wonderful dining, shopping, salons and a Grande Theater. The perfect beach escape can be achieved when you stay at Calypso. We love the the Panama City Beach area! Pier Park is just across the street for the ultimate in convenience. Wonderful dining, shopping & the Grand Theatre at Pier Park. Even though we only got to stay 2 of our 7 nights due to Hurricane Michael, we still enjoyed it. The condo was very nice! Thank you for your review. We are sorry that Hurricane Michael decided to crash your vacation plans. Please visit us again soon next year. Thank you for providing us with this feedback. We hate to hear that your experience was anything less than perfect. We always encourage our guests to share any concerns they have with us while they are in town. We would have loved the opportunity to address them and let you get back to enjoying your vacation. We hope to see you in Panama City Beach in the future and are always here to help you with any of your vacation planning needs! Thank you for your review and feedback. We are glad to hear you had a great experience. Also we ask for extra nights and they added with no worries!!! We love a good family vacation and we are happy to know that you had a great time! Thank you for your review! Loved the beach this unit not so much! No linens or blankets left for sofa bed, but did send someone over with a set of sheets only. On the day of our departure someone came by before our checkout time to put items out for the next guest. And proceeded to come on in and put those items in the condo even after he realized we had paid for late checkout! We also didn't not have these items left for us when we arrived and our door code also did not work upon our early check in and our door code didn't work after 9 on check out . But we did enjoy the beach, location and the Calypso not so much this unit. Thank you for taking the time to review your stay. We are glad to hear that you enjoyed the beach and the location! Thank you for reporting the missing sheets to us. We are so glad that we were able to get a new set delivered to you immediately. We apologize for the inconvenience you experienced during checkout. We aren't sure what items you are referring to that weren't also left for your stay as we have a standard starter kit for all of our properties. However, no one should have been in the unit before your checkout time so we apologize for that. We hope to see you again in the future! Aubrey-Thank you for choosing to stay with Southern during your recent getaway to Panama City Beach. And we appreciate you taking the time to provide us with a review. It is always nice to hear back from our guests and we are thrilled that you enjoyed your stay so much! Please come back and visit soon.